When last we left our intrepid gardeners, we were all on the path toward clearing up the land and getting ready for garden season. We’ve had some positive developments out at the farm, getting all the soil tilled and turned for planting, and some setbacks at the quarter acre, related to a section of land that turned out to be horrifically root-bound, and so we’ve had to move the garden. But before we go any further, this is a follow-up on the last post about using seeds. It’s time to get planting (truth be told, it was probably time to plant a week or two, but we’ve all been so busy, it’s been hard to write!) and we can worry about land-use later. If your seeds have arrived, it’s time to get organized for planting. If you haven’t bought yet, there’s still time, just read our guide to seed-buying, or be ready to plant seedlings when the time comes. I’ve not had luck with direct planting in the past, and so this year, I decided to get an indoor kit to start the growing of my seedlings before transplanting them to the outdoors. Gardeners Supply sells an awesome seed-starting kit that features soil, self-watering and reservoired divided planters that are perfect for this kind of thing. There are well-written instructions that walk you through most of the details of getting your seeds started. Make sure to get a good density of soil in each of the pods, though, as when it comes time to transplant, you want a firm pod of dirt instead of a crumbly mess, but you don’t want it too hard packed so that the roots won’t form a good clump either. I planted about 15 varieties in my four trays of soil, including radishes, peppers, tomatoes, peas and some herbs, and I’ve had an excellent turnout so far. One of the biggest thing you need for your seeds is a decently warm place to put them. 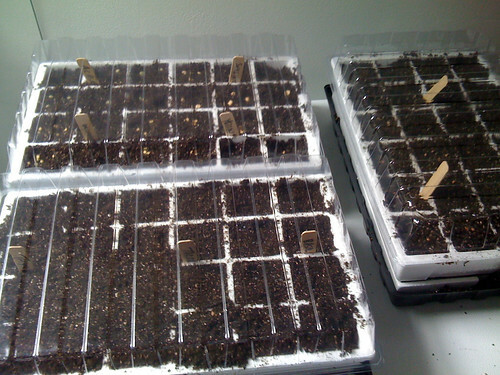 Most seeds germinate based on soil temperature, and that will make a big difference in how successful your seeds are. Cold-weather crops will succeed above 50F, and warmer weather crops will start to sprout above 60F, so find a good place that you can expose them to sunshine to add heat to the equation, especially with the clear-plastic lid designed to trap heat close to the soil. DCVG: Check out the Community Garden at Wootton’s Mill Park, which has a very reasonable rent per plot, and may still have some available space. Give them a call at 240-314-8660 for more info. Ellay: I’m ready to start my urban(Manassas) balcony garden, but I need some handholding and I am too cheap to spring for the pricey VicGar tome jr. In addition, how do I deter the birds that have suddenly taken any interest in my balcony? DCVG: Birds are definitely a threat to any balcony garden, but you’ve got some easy options to fix that. Get a length of fishing line (Clear) from any sporting goods store, and an old CD you don’t listen to anymore (the shinier the better, on both sides) or a dead CD blank, and suspend the CD from the ceiling on your balcony, so that the CD can spin in the breeze, which will scare off the birds. If you’ve got garden questions, please send them to tom at welovedc dot com with the subject “DC Victory Gardens”. 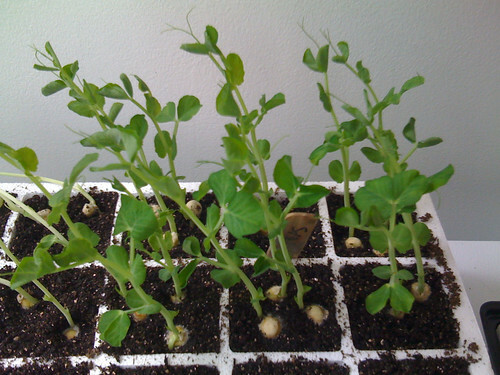 JD Roth’s excellent “Get Rich Slowly” blog had a good writeup last month on starting seedlings. Interestingly, the post claims that a standard fluorescent setup will work well as a supplement if you have a placement with some natural light. I’d be very interested to hear some validation of that. I agree – great post with sound advice and tips. Does a $50 seed starting kit make up for the cost by saving money on purchasing seedlings? We use flourescent bulbs in shop lights – one warm and one cool in each fixture. Are you fertilizing the seedlings yet? Since the kits are re-usable, year to year, I think it makes a difference. Many years, I’d spend at least that much on seedlings, and this way I can use less expensive seeds. The kits come with a bit of fertilizer, and I’m using that on the now sprouted seedlings, once per couple days.